The first 2018 Santa pictures popped up on my newsfeed on November 30th. It was Onyx's 3 month anniversary and seeing cute photos of people's kids in their little Christmas outfits with Santa made me really sad. 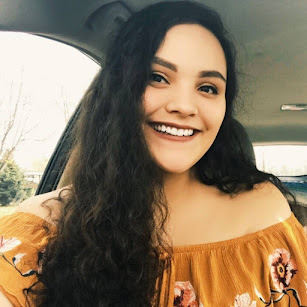 I kept thinking about all the holiday traditions that I wanted to start with Onyx and ended up crying for a good portion of that day about it. Later that night I realized I could still get Onyx's photos taken with Santa - they'll be different, of course, but I can still do it! So I decided that we'd go to Santa and have him hold Onyx's bear + a photo of him. 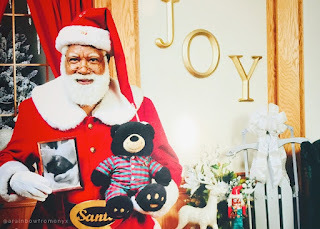 There's a famous Santa at the Mall of America named Santa Larry and when Onyx was still alive, I had planned on having Onyx's photos taken with him every year. So I hopped online and searched for an appointment. Santa Larry gets booked super quickly so there was literally ONE appointment time left for the entire season and guess what? I was able to book it! I started to get really excited about it and felt like it was a little nudge from Onyx saying "see mama, you can still do this stuff". STILL. 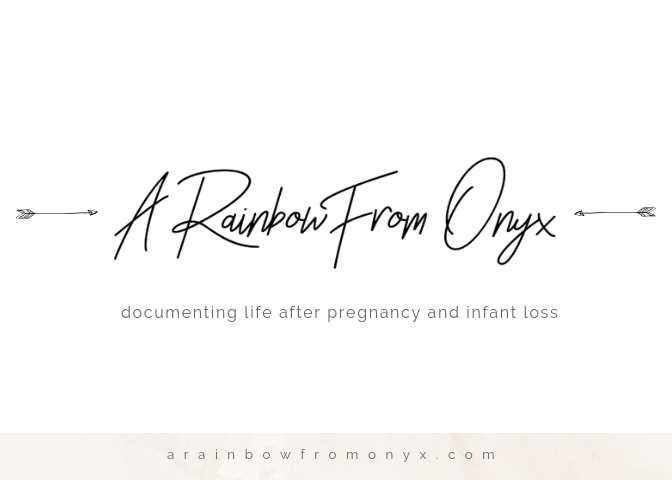 That's such a triggering word for me because Onyx's medical records say stillborn. But it was at that moment that I decided that I am not going to let baby loss take away the happiness of holidays and traditions. I am STILL going to decorate the Christmas tree. I am STILL going to get Onyx a stocking. I am STILL going to get his pictures taken with Santa damn it! I am taking back the word "still" by still doing things that I had planned on doing when my baby was still alive. Now, tradition-wise I thought it would be cute to have our Onyx Bear in Christmas pajamas. This is going to be the tradition for our future kids as well and it makes me happy to even just think about it (I'm definitely going to be that mom that matches their kids' clothes and I have no shame). In terms of grief, it's only Day 4 of Advent for Onyx and I've already had a couple breakdowns. But I am not going to let baby loss win. Yes, there's lots of sadness, but I also have so much joy when I think about what I wanted to do with Onyx. I have so much joy when I think about Onyx being incorporated into the traditions that we do with his future siblings. I have so much joy when I think about the ways that I'm still continuing to support his existence even though he died. Baby loss has taken so much from us, but it's not going to take away everything. Onyx existed and will continue to exist not only in our hearts and memories but outside of them too. *Check out my Youtube video of Onyx "meeting" Santa and some of my other reflections about the holidays after baby loss!